Growing up in a family of six girls in Mumbai, we were taught to believe that we could do anything if we worked hard to achieve it. As a grown woman in the US I still believe that’s true but also realize one needs a host of other forces to help achieve one’s vision. In the I Can’t, Yes I Can Project that I recently facilitated in the Golibar slum of Mumbai, India, I gained a new appreciation of how challenging that task can be, the role that society, culture and economics play and what individual and group strength means. I worked with the women from Marketplace: Handwork of India, an innovative fair trade, not-for-profit organization. 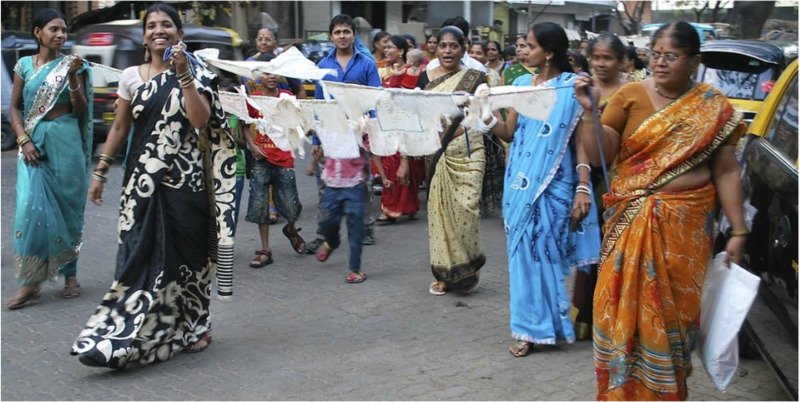 Located in the Golibar slum of Mumbai, MP combines the experience of running a business with a variety of support programs, designed to effect real, meaningful, and lasting change in the lives of low-income women in India. The goal of the I Can’t, Yes I Can, Project was to help women identify and take advantage of their strengths and the power inherent in these strengths while encouraging them to access available avenues of hope. In a series of workshops we first addressed issues symbolized by the words “I can’t” As girls grow up their roles in society are influenced by boundaries, what they cannot do. This is reinforced by one’s family, the larger society and repeatedly presented in popular culture. In our next session we focused on strengths and power. What strengths do we each possess? Do our strengths allow us to push the boundaries laid out by society? At each of the workshops the women drew images depicting their I Cant’s and Yes I Can ideas on fabric squares. At the culminating event, the Artisan Day celebration the women took turns explaining and sharing the workshop process and their experience with the larger MP group. They related their I Cant’s and then invited the whole group to help tear up the I Can’t fabric squares into strips, which were tied in between the Yes I Can flags. This ritual tearing allowed the women to symbolically destroy their own and societal notions of what they cannot do. The strings of flags were triumphantly carried through the streets of Golibar to the Marketplace office where they were installed in rows across one of the MP office entry doors. The women chanted, “we are strong, we can do anything” as they marched and stopped traffic. It was quite exhilarating. Through the process the MP women had an opportunity to reflect on the restrictions society and cultures have placed around them. They discovered that they had the power to change old value and belief systems and re interpret the traditions and myths that had once seemed absolute. During my current visit two years I decided to do a follow up reflection on the I Can’t, Yes I Can Project. We started by watching the video LINK. The follow up discussion showed that changes were both subtle and far-reaching. The major change was a heightened awareness of their abilities.. “I am more confident”, I take more responsibility in my family and my daughter is studying to be an engineer, I started treating my daughter in law differently. While our conversation brought up memories of the past project our reflection discussion served to remind us of how far we had come.